I recently stopped at a vendor in Montego Bay, Jamaica, to purchase peeled June Plum. Yes, she sat right there on spot and peeled them, then placed few of the fruits in bags, and sold at her prescribed prices. 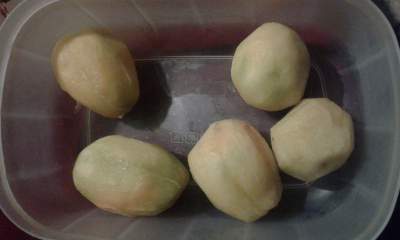 Another customer came along and ordered her peeled June plums. Jew plum is also another name for this fruit. However, I saw this vendor took out a jar of salt and sprinkled it on the customer's June plum. Then to top it off, she also sprinkled a good amount of hot pepper sauce on the fruits to the delight of the customer who appeared as if this was a habitual practice. I cannot recall any of my close relatives doing such a preparation to devour their June plums. So I asked the vendor if this was what the customers wanted. She said yes, and continued by saying that most of them wanted it no other way. She therefore made sure to arm herself with free salt and pepper to please her customers. She further stated that she had tried it and it was very delicious. I am not sure, I would enjoy such a concoction. I prefer mine in the natural way which is simple peeling and eating. The thought of eating so much salt, which is not good for high blood pressure sufferers plus, the tears that will flow from my eyes by eating so much pepper, I would completely forget what I was eating. say, is a must for many Jamaicans. Jamaicans love varieties and they will go to the length and breath to spice up whatever they are eating. We are definitely innovative. June plum, when in season, just like guineps, can be found at every street corner. Peeled or unpeeled, pick your choice. Eat them whole or making June plum juice is also your choice. Green or ripe, whatever your preference, it is your pick. I love both green and ripe fruit but prefer the ripe June plum to make juice. Some persons make it into preserves, stews, sauces and other savoring dishes. June plum juice mix with ginger is very refreshing, especially if the heat is on. It is also highly nutritious. It is definitely good for the body and it is packed with vitamin C and iron. It is very easy to make June plum juice, which is good to treat diabetes as well as high blood pressure. Some persons boil the fruit to make it easier to blend while some will dice the fruit, excluding the seed of course, and then blend. If you have never tried eating your June plum with salt and pepper, and you feel you would like to give it a try, then the ball is in your court. Wash and dice June plums. Grate ginger and place all ingredients in a blender. Blend until smooth. Strain and serve.